The tape begins during the chorus prior to the guitar solo in Over the Hills and Far Away. The tape is cut between songs. Bonzo thrashes wildly at anything within reach during Since I've Been Loving You. Page's That's the Way reference has become a regular feature of the instrumental breakdown during Bron-Y-Aur Stomp, much to the crowd's delight. A large chunk of The Song Remains the Same is cut prior to the first verse. 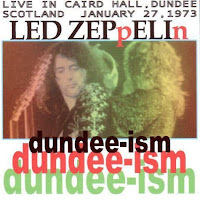 The audience recording ends at the beginning of the lead-in to the bow solo during Dazed and Confused. The soundboard tape begins in the middle of the theramin freakout during Whole Lotta Love. The explosive Everybody Needs Somebody to Love section includes an excellent funky breakdown. Bonzo is out of control during the riotous medley, which includes Boogie Chillen', a raucous rendition of Elvis Presley's (You're So Square) Baby I Don't Care, Let's Have a Party, I Can't Quit You Baby, which features an amazing blues improvisation, and Goin' Down Slow. Plant sings a line from Ramble On during the coda. Page blazes through the solos during Heartbreaker. As the band leaves the stage following Communication Breakdown, Plant tells the crowd "it's been a pleasure and you've been very nice too, so take care." The audience tape is quite muffled and hissy. The soundboard tape is excellent. Click here and here for audio samples courtesy of Black Beauty.